In my last blog, I wrote about Matt, the cartoonist for The Daily Telegraph. He celebrates 25 years of writing and drawing seriously brilliant cartoons. Matt comes across as almost embarassingly shy. Not exactly a 'type A' salesman. If you're in direct marketing, the story of how Matt got the front page gig at one of the world's biggest newspapers clearly shows the most important part of direct marketing: PERSISTENCE. Matt discovered the decision maker and dropped off cartoons and jokes six days a week. After dropping off the material, he would 'hang around' hoping to speak with the decision maker. Ultimately, the newspaper asked him to produce a cartoon every day. Yes, if you're a direct response copywriter, or a direct marketer, the copy has to be persuasive. But, ultimately, persistence is always going to pay off. Matt provides the proof. And he's the least exuberant hype-like person I've ever seen. Headlines will draw the reader into the copy. 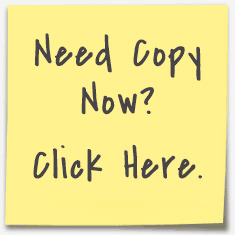 The highest converting copy will clearly show the reader how you solve their problem or scratch their itch. Simple, clear copy will be (mostly) more effective than hype-y copy. But test. Easy to understand offers will pull more than complex and convoluted offers that even a Mensa member would be find confusing. Mitigating risk will be vital. Avoiding words like ‘mitigating’ in copy will be vital. Strong subheads will be important because readers initially skim the copy. Somebody will try to be creative, break all the rules of direct response copy, fail miserably, and look like a dolt. Friendly, warm, conversational copy will prove more effective than dull copy. For any copy that tries to convince the reader to pull their credit card out of their wallet, even for a trial offer, long copy will be more convincing than short copy. Clear and precise PROOF will be extremely important. Those who view a direct response copywriter as an investment will thrive. Those who view direct response copywriting as an expense or commodity will fail. Direct response copywriters who 'check their egos at the door' and tweak and change based on data will get work; those who fail to pay homage to visual website optimizer, etc. will starve. Direct response copywriters will look for clients who understand (and love) direct marketing. “BUT WAIT!” you say, "that’s ‘old’ stuff. Surely there’s something NEW and INNOVATIVE coming up! First, don’t call me Shirley. Second: the core principles of direct response copywriting haven’t changed for 200 years. They won’t change in 2013. And they won’t change for another 100 years. And that's my FEARLESS prediction. In High School, I Interviewed Margaret Thatcher. And Lived. In High School, which I attended in London, I was an editor of the school newspaper. I loved it and it’s a reason, I suppose, that I’m a writer. I’m certainly NOT a journalist. One of my fellow editors was Simon Sebag Montefiore, who has become a famous author in the United Kingdom. Simon’s bibliography includes massive biographies of Stalin and Potemkin and you’ll read his writing in UK newspapers. He wrote a book about Stalin; I wrote one about Caddyshack. Enough said! During the early 1980s, for the school newspaper, we interviewed Ken Livingstone, who was essentially the Mayor of London. His nickname was ‘Red Ken’ and it was a fascinating interview. A little later, I told Simon we should try to interview Margaret Thatcher, who was then Prime Minister. So we wrote to Robin Butler, now Baron Butler of Brockwell, who was Thatcher’s Personal Private Secretary. For those of you in the United States and elsewhere, perhaps, the Personal Private Secretary (PPS) doesn’t take dictation: the PPS is essentially the Chief of Staff and head of The Civil Service. I have to admit we had an ‘in’ as Robin Butler had attended our school and Margaret Thatcher’s son, Mark, also attended the school. So, in the Autumn term of 1983, Simon and I took the tube to Central London, and interviewed the Prime Minister at 10 Downing Street. We went to the barrier at the Whitehall end of Downing Street where a policeman told us to see the policeman at the door of number 10. That policeman let us in and we were ushered into a waiting room. After a few nervous minutes, we were walking up the stairs next to the portraits of former Prime Ministers. Then we were there, in her office, sitting down with Robin Butler, Margaret Thatcher, and a tape recorder. We had planned some ‘tough’ questions plus some easier ones. I’m not sure what the Prime Minister was expecting but she quickly realized that we were trying to be ‘big time journalists’ and treated us as such. Which meant she was in no mood to take any prisoners. I left with jellied legs. Here’s the interview—edited for brevity. The other day, while cleaning out some stuff in my house, I discovered the cassette of the interview and had it transferred to a CD. One of these days I’ll upload the full audio interview. I can barely listen to it—I’m so gobsmacked embarrassed. I can’t believe I was 18 and went into 10 Downing Street to ask The Iron Lady some ‘hardball’ questions. WAS I OUT OF MY MIND? Whatever your political persuasion, you’ll enjoy the interview. Please remember that I was just 18 and totally out of my depth. But with all the palaver going on over the movie, I thought it was a good time to write about the interview. In the school newspaper, Simon wrote the piece after the interview—about going to #10. Meeting Margaret Thatcher was enormously intimidating. She was at the height of her power and was rock-solid about her politics.